There are a raft of crime fiction events that take place around the UK and we’re spoilt for choice when it comes to deciding what to attend. However, I often cast envious eyes towards other crime writing events around the world, especially Bouchercon in the US and The Body in the Garden in Australia as they often include writers who don’t make it over here. 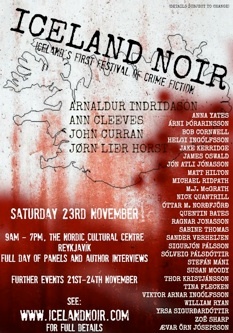 For once, I’ve found it impossible to resist an event: Iceland Noir which is taking place in Reykjavik between the 21st and 24th November. The king of Icelandic crime fiction is, of course, Arnaldur Indridason and he is the special guest of honour at the festival. Also appearing are some of the best of Iceland’s writers including Yrsa Sigurðardóttir, Ragnar Jonasson and Viktor Arnar Ingólfsson. All of these authors have had their novels reviewed on this blog with the exception of Ragnar Jonasson whose books are yet to be translated into English. I was lucky enough to read the first six chapters of his novel ‘Snowblind’ which is currently only available in Icelandic or German. Fingers crossed that he gets a British publisher soon. Other writers attending the event include Ann Cleeves, Jorn Lier Horst and Willian Ryan. The full itinerary can be found here. There are limited places available so if you’re tempted now’s the time to book. I have already booked mine. It promises to be a special event. So you are going? It sounds perfect for you! So are you going? Sounds like it would be perfect for you! Sorry – I should ahve made it clear that I *am* going: I’ve amended my post to make it clear! And yes, Shelleyrae, it’s perfect for me. What a lovely place to visit, Sarah. I first read about Iceland in a non-fiction book detailing the controversial 1972 world chess championship in Reykjavik between American chess prodigy Bobby Fischer and defending champion Boris Spassky of Russia, at the height of the Cold War. I hope you have a good time and get to meet some terrific writers. I’m afraid I know nothing about chess, Prashant. But I do intend to do some non-fiction reading before I go too, so I may read about the famous championship! Oh good for you, Sarah, what a great thing to do! Look forward to hearing all about it. Sounds wonderful and adventurous, with some of the best global crime fiction writers. Glad you are going and will be eager to read the reports. I’ll be sure to take my laptop Kathy. Oh I really am jealous Sarah – on top of crime fiction I have been reading otherwise about the country – recently read a historical speculative biography about a woman who was executed in the early 1800’s there and also reading some long form articles about the banking crisis there and the recent changes in the political system – It’s all been rather interesting. Hope you enjoy your trip and the event. Thanks Bernadette. What was the name of the book? It sounds intersting and a bit different to what I ususally read. Oh! I’m so excited for you! How marvelous. Just remember, your readers are going to want a full itinerary, and I, for one, will wish for a culinary tour, such as what did you eat, what was it like having all matters of fish for breakfast, etc. This sounds wonderful. I echo everyone. We want full details of your experience there. I promise I will give a full update. Me too. Very glad that you are going and are going to report back. I have enjoyed the one book set in Iceland that I read and plan to read more. The whole event sounds exciting and fun.